Wonder Woman (2009) - Two-Disc Special Edition | Movieman's Guide to the Movies > > The Final Word on Blu-rays, DVDs and Movies! The latest member of the DC Universe Original Animated Movies line of direct-to-video movies, Wonder Woman, is a finely animated, though very short, feature film that introduces us to the Amazon princess that before this the masses only knew from Lynda Carter�s live action TV series in the 1970s. Wonder Woman follows other DC Universe animated movies that began in 2007 with Superman: Doomsday followed by Justice League: The New Frontier and Batman: Gotham Knight in 2008. The next project on slate is an intriguing Green Lantern movie that I�ll cover in the special features section. Wonder Woman is an origin story based on the �Gods and Mortals� comic book story arc by George P�rez released in 1987. The movie begins with a 300-like battle between the Amazon women and an army led by the God of War, Ares (voiced by Alfred Molina). The Amazon�s queen Hippolyta (Virginia Madsen) defeats Ares, and killing their son, but is ordered not to kill him by Zeus to keep him prisoner where he is branded with bracelets that will not allow him to use his powers. As with the �Gods and Mortals� storyline, Hippolyta receives a daughter as a gift from the gods and together with the remaining Amazons live in peace on the island of Themyscira, cut off from the outside world of man... until fighter jet pilot Steve Trevor (Nathan Fillion) crashes on the island and is captured by the queen�s daughter, Diana (Keri Russell). After determining Trevor is not a threat, the Amazons hold a competition to see who will represent them and return Trevor to the outside world. 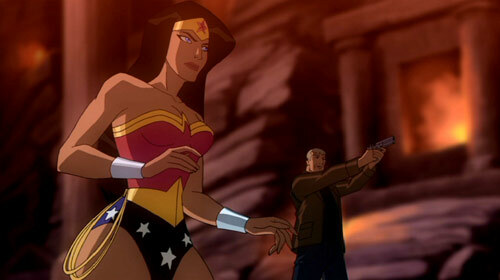 Despite going against her mother�s wishes, Diana competes and wins but her duties go beyond returning Trevor after Ares escapes from his cell (with the help of a fellow Amazon) and now she must, donning the hot �Wonder Woman� we all know and love, hunt down and capture Ares before he unleashes war upon the modern world. Outside of Lynda Carter�s beautiful, um, performance was Wonder Woman on the TV series, I�ve actually never been a fan of the character (to be honest, Superman isn�t that high on my list either) but I admire what the filmmakers have done with this animated feature film and what DC Universe has been doing with them unveiling a couple each year. Producer Bruce Timm, the man most associated with bringing us "Batman: The Animated Series", one of the best animated series ever made, gives Wonder Woman a breath of new life and a uniqueness in the superhero world rarely seen. There�s no doubt the character did a lot in the cause of women�s rights as she was one of the first comic book characters created that could compete with the boys. As far as the animated movie goes, Wonder Woman is a fun adventure with some of that sly humor and the voice chemistry between Keri Russell and Nathan Fillion was fantastic (the two worked together on 2007�s Waitress). The voice casting for the villain Ares by Alfred Molina brings a bit of sinisterly depth while we get the voice talents of Rosario Dawson as a tough Amazonian, David McCallum (TV�s �NCIS� and also was the voice of Alfred on Batman: Gotham Knight) as Zeus, Marg Helgenberger (TV�s �CSI�) as Hera, Oliver Platt as Hades and Virginia Madsen as Diana�s mother. Wonder Woman isn�t the greatest animated movie but as a re-introduction to a character long dormant (I believe the comic book was cancelled), it�s a good origin and adventure story that could lay the groundwork for either DTV sequels or even a �Wonder Woman: The Animated Series� for television. Wonder Woman comes to home video with the Blu-ray and �Two-Disc Special Edition�, covered here. Audio Commentary features Executive Producer Gregory Noveck, writer Michael Jelenic, Producer Bruce Timm and Director Lauren Montgomer. First Look at DC Universe�s Upcoming Green Lantern Animated Movie (10:11) � This featurette gives us a glimpse at character designs for the Green Lantern movie along with interviews from the crew and introducing us to the voice talent that includes Christopher Meloni (TV�s �Law & Order: SVU�), Victor Garber (TV�s �Alias�), Michael Madsen (every other movie ever made) and Tricia Helfer (TV�s �Battlestar Galactica� and �Burn Notice�). Presented in anamorphic widescreen. There are also those �First Look� featurettes for other DC Universe movies: From Graphic Novel to Original Animated Movie � Justice League: The New Frontier (10:44), Wonder Woman: Amazon Princess (10:25) and Batman Gotham Knight: An Anime Evolution (10:09). The Wonder Woman featurette I believe was featured on the Batman Gotham Knight release. Note: The �Wonder Woman� and �Batman� featurettes are presented in non-anamorphic widescreen while the �Justice League� one is anamorphic. Wonder Woman: A Subversive Dream (25:33) � This is a profile on �Wonder Woman� creator William Moulton Marston and the creation of the iconic female superhero and her start at DC Comics. It goes into the breakthrough Wonder Woman had on not only in comic books but on society as well. Where �A Subversive Dream� covers how the character was created, Wonder Woman: Daughter of Myth (25:36) goes over the story of �Wonder Woman� from the comic books, has some information already in the previous featurette but then goes into the mythology of Wonder Woman (i.e. Greek gods) and where exactly Marston came up with the idea. 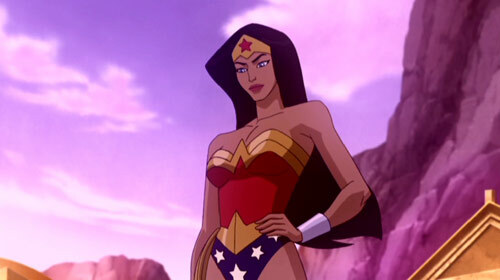 Bruce Timm�s Top Picks are two episodes for �Justice League: Unlimited�, both of which are Wonder Woman-centric. Last is a downloadable Digital Copy for use on iTunes (and the iPod). Wonder Woman is presented in anamorphic widescreen (1.78 AR) and given it�s a new animated feature, it does look good as unless it�s on purpose, you will not have dust and scratches. Colors are vibrant without being too bright in some areas and with the animation style; it�s not a bad looking film. I was less impressed with audio, however. Warner gives the movie a regular Dolby Digital 5.1 and maybe I�m losing my hearing but everything sounded a bit muffled at times. Though the score was nice it was not a great audio experience. Serviceable perhaps, but not great. For DC Universe�s third direct-to-DVD release is actually not bad, the animation style isn�t anything spectacular but compared to the character designs in the TV series (like �Justice League�), it is an improvement, at least on the Wonder Woman design. As for the movie itself, as I said, I�ve never been a huge fan of the character but the movie delivers some nice action and PG-13 violence that it makes this at least a rental for fans of animation.